I live in the Northwest "Rainforest", I feel this greatly influences my mind and work. Welding, Quilting, Botanically inspired Art. Playing with textile paint, rust, vintage anything! I try to keep my art unique and close to the things I enjoy working with. It's time for a Garden Party! I'll be showing at Garland Nursery on Saturday 28th and Sunday 29th. I'll have some of everything on display in the Garden this weekend, bugs, birds, heart, snails, you name it I might have it. across many times in my youth. This sculpture will be going back to its roots to live on the ranch from where the cattle guard scraps originated. 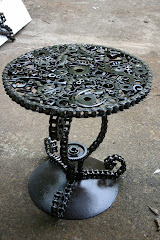 I have been working with recycled metal for a little over ten years. I seek out, not new, but old industrial castoffs such as farm tools and antique tractor parts. These pieces, that are featured in my work, hold the history of our farming and logging communities from rural Oregon. I have family roots in these fields, so by using parts from old tractors brings a feeling of connection to my family’s history. I feel it is my duty to save these special parts from being melted down for “scrap metal”. It makes me cringe every time I see a truck loaded down with metal, headed for the scrap yard. I just have to wonder what great parts I am missing out on! Recycled Metal Artist and Art Quilter, I Love the old,rustic,(and rusty). My love of the outdoors hopefully shows through my work. My biggest problem is trying to split my time between Quilting and Welding.